1. Agreement: The Owners and Guests agree as follows: Guest is over the age of 21 and will be an occupant of the unit during the entire reserved period. Other occupants will be family members, friends, or responsible children. No door key codes or key will be issued to anyone other than the tenant listed on rental agreement. The maximum number of guests per 3bd/2ba condominium is limited to eight (8) persons. The maximum number of guests per 2bd/2ba condominium is limited to six (6) persons. The maximum number of guests per 1bd/1ba condominium is limited to four (4) persons. This property requires a (3) night minimum stay and longer stays may be required during holiday periods. Rates are subject to change without notice. 2. Pets: No pets allowed. A fee will be assessed if tenants have pets in unit. 3. Smoking: No smoking allowed in the units. A $400 fee will be assessed if tenants smoke in unit. 4. Deposits/Payments: An advance payment equal to 50% of the rental rate is due at the time of reservation. The advance payment will be applied toward the room rent. The BALANCE OF RENT is due thirty (30) days before your arrival date. If initial reservation is less than (30) days, full amount is due upon reservation. Payment can be made by credit card, personal check in U.S. funds, bank money order or cashier’s check payable to Turtle Bay Condos, LLC. A $35 fee applies to all returned checks. 5. Damage Waiver Fee: A $39.00 nonrefundable Damage Waiver Fee is required for all reservations. 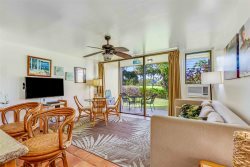 Turtle Bay Condos, LLC requires a valid Visa, Master Card or Discover Card number on file in addition to the $39.00 Damage Waiver Fee. The Damage Waiver Fee is a nonrefundable Fee that relieves Guests of the cost for unintentional and accidental damage to the Property and its contents, not to exceed the amount of coverage (up to $200.00 of unintentional damage). In the event of damage, guest must take all reasonable, necessary steps to protect the property and prevent further damage to it; report the damage in writing prior to check-out to Turtle Bay Condos, LLC staff. The Damage Waiver Fee does not cover intentional damage, theft, unauthorized entry into the owner’s supply closet, unauthorized pets, unreported damage, extensive cleaning required at check-out, smoking, exceeding occupancy limits or parking limits, and any other charges/polices in Turtle Bay Condos, LLC’s Rental Policies and Rental Agreement including any fines imposed on Turtle Bay Condos, LLC or Property Owner by the City, County, State or Home Owner Association as the result of violation of any law, ordinance, rule or regulation or any fines or costs levied against Guest or visitors of Guest (Excess Damage Costs). Guest will be notified of any Excess Damage Costs in writing. Any Excess Damage Costs will also be charged immediately to the Guest’s credit card. Guest assumes full responsibility for any items found to be missing and any damage due to misuse, negligence or action on Guest’s or Guest’s visitors’ part, except in the case of normal wear-and-tear reported to Turtle Bay Condos, LLC within 48 hours of Check-in. I hereby authorize my credit card to be charged for unintentional damage beyond $200 and for any intentional damage, theft, occupancy after departure date or departure time, unauthorized pets, excessive cleaning required at check-out, smoking, exceeding occupancy or parking limits, and any other mentioned charges/policies in the Rental Agreement including any fines imposed on Manager by City, County or State as the result of violation of any law, rules or regulations or any fines or costs levied by any Home Owner/Condominium Association for violations of any Covenants or Restrictions by Guest or visitors of Guest ("Excess Damage Costs"). I/we have read and agree to the Damage Waiver Fee section of this Agreement. If the credit card listed in the above “Damage Fee Waiver Clause” does not provide sufficient funds for “Excess Damage Costs,” as defined in the above “Damage Fee Waiver Clause,” I do hereby personally guarantee payment for such damage. And furthermore, I as the guarantor do hereby authorize and empower any attorney of any court of record of the state of Hawaii or elsewhere to appear for and to enter judgment against us, or any of us, in favor of Turtle Bay Condos, LLC for any sums due under the above “Damage Fee Waiver Clause” plus interest with costs of suit, release of errors, without stay of execution, and with thirty-three and one-third percent (33 1/3%) as a reasonable attorney’s fee, and the Guarantors hereby waive and release all benefit and relief from any and all appraisement, stay or exemption laws of any state now in force or hereafter to be passed. 6. Storage of Food Items: Guests to maintain a clean environment in the unit by not leaving food items out with containers open. Most food items should be kept in the refrigerator to prevent attraction to pests. Food spills, crumbs, etc. should be cleaned promptly. 7. Check-In/Check-Out: Check-in is at 3:00 pm HST. Check out time is 11:00 am HST. If you checkout later than 11:00 am, you will be charged twice the nightly rate for each additional night. Early check-in and late checkout requests are available for an additional fee based upon availability. These requests must be made 24 hours in advance. Please contact reservations for details. Any issues with the unit need to be brought to management’s attention right away during your stay so that we can make it right. Resolutions cannot be offered if issues are not brought to our attention during the stay. Turtle Bay Condos, LLC staff will only be able to address any issues with registered guests of the unit. 8. Lost and Found Items: In addition to shipping and handling charges to return items left behind, we charge a $25 fee to look for and retrieve lost items. 9. Parking: Parking on-site at properties requires a parking pass. There will be two complimentary parking passes in the condominium for your use. Security requires they are placed in your call at all times when on property. Please leave the parking passes with the FOB in the condominium upon check out. Any parking passes not returned will result in a charge of $10.00 per pass to the credit card on file. FOBs are used to gain entrance to the property. FOBs lost or not left in unit the day of departure will result in a $200.00 charge on the credit card on file. 10. Cancellations: A thirty (30) day written notice is required for cancellation. Cancellations that are made more than thirty (30) days prior to the arrival date will be given a full refund, minus the $25 booking fee + tax. Cancellations or changes that result in a shortened stay, that are made within 30 days of the arrival date, forfeit the full advance payment and damage/reservation deposit. Cancellation or early departure does not warrant any refund of rent or deposit. Turtle Bay Condos’ cancellation policy does not provide refunds for unforeseen developments such as illnesses, mandatory hurricane evacuations and similar events that can affect your trip. We strongly suggest that you purchase travel insurance. Airbnb reservations defer to the Airbnb cancellation policy. 11. Monthly Reservation Cancellations: Monthly renters must cancel (60) days prior to check-in. Monthly renters who make a change that results in a shortened stay must be made at least sixty (60) days prior to check-in. 12. Guests Liability: Guests agrees to accept liability for any damages caused to the property by guest or guest’s guests, including but not limited to, landscaping, misuse of appliances, and/or equipment furnished. If damages are in excess of the damage waiver, guest agrees to reimburse owners for costs incurred to repair/replace damaged items. Illegal and/or Disruptive Activity: Turtle Bay Condos, LLC reserves the right to remove any individual from the premises for any illegal or disruptive behavior on the premises. Turtle Bay Condos, LLC reserves sole discretion in determining if a guest should be removed from the premises for illegal and/or disruptive behavior. No arrest or conviction is necessary for Turtle Bay Condos, LLC to remove an individual from the property. If an individual is removed from the property for such activity, no refund will be issued for moneys paid to Turtle Bay Condos, LLC. 13. All units are privately owned. Owners do not assume any liability for any loss, damage, or injury to persons or their personal property. Neither do we accept liability for any inconvenience arising from any temporary defects or stoppage in supply of water, gas, electricity, or plumbing. Nor will owners accept liability for any loss or damage caused by weather conditions, natural disasters, or other reasons beyond its control. 14. Walkways and Common Areas: The guest is fully aware that the walkways can be dangerous, that they can be slippery when wet, and that injury is likely to occur to anyone not using caution. Guests should observe and adhere to all rules and policies as posted at the property. With full knowledge of the above facts and warnings, the undersigned accepts and assumes all risks involved in or related to the use of walkways and common areas. The pool areas are unsupervised and NO LIFEGUARD is on duty. Tenants assume full responsibility while using the pools and common areas at and will exercise caution at all times. All children must be supervised by a responsible adult at all times. There is no skateboarding allowed on property. No glass is to be used in the pool area. Quiet time on the property is observed from 8:00PM – 8:00AM. Please be respectful to you neighbors while on site. 15. Additional Terms and Conditions: The guest, for himself/herself, his/her heirs, assignors, executors, and administrators, fully releases and discharges actual Owners from any and all claims, demands, and causes of action by reason of injury or whatever nature which has or have occurred, or may occur to the undersigned, or any of his/her guests as a result of, or in connection with the occupancy of the premises and agrees to hold actual Owners free and harmless of any claim or suit arising there from. In any action concerning the rights, duties or liabilities of the parties to this agreement, their Principals, agents, successors or assignees the prevailing party shall be entitled to recover reasonable attorney fees and costs. 16. Travel Insurance: Turtle Bay Condos, LLC has partnered with CSA Travel Protection to provide optional coverage for our guests. CSA provides trip cancellation and interruption services, as well as emergency assistance and travel services, covering financial losses. If you choose not to purchase insurance at the time of the initial reservation, you may call or email us to add trip insurance up to 30 days prior to your departure. Please contact Turtle Bay Condos, LLC for more information. 17. Hurricane Policy: We strongly recommend you purchase travel insurance. No refunds will be given for storms and hurricanes. In the case of a Hurricane Warning issued for `Oahu within 48 hours of arrival, a one-time date change, without penalty, may be available and is not subject to further change or cancellations. Date changes must be made within one (1) calendar year of original dates of stay.